For many Southern Californians health is a top priority (or at least the upper middle class, educated, generally, liberal Californians – aka you, me…us?). The state as a whole has been forging health trends for the last two decades, many of which have swept the nation, including major public health initiatives, like smog checks for clean air, anti-tobacco and bike helmet laws, to lifestyle trends, such as yoga, sustainable living, organic eating and meditation. This is the stage I believe the new wellness trend, human placentophagia (mother’s who eat their placentas after birth), is in. The practice is seen as a little weird, okay, fine, maybe very weird to many outside of a few select wellness communities across the country but it’s slowly gaining traction as mothers look for natural ways to assist with the challenges of recovering after giving birth. The tradition of ingesting ones own ground up and encapsulated placenta has been practiced in Traditional Chinese Medicine for centuries. Stated benefits include, increased energy and mood stabilization, increased milk supply, improved skin elasticity, helps stave off postpartum depression, and replenishes the body with nutrients. Due to the dearth of rigorous scientific studies on placenta ingestion, anecdotal accounts of women whom have gone through the process make up the main sources of evidence for said benefits. But that hasn’t slowed down the practice’s growing popularity. To get a better understanding of this emerging wellness trend I reached out to doula, yoga teacher and meditation guide, Paula Mallis, on the what, why and how of placenta encapsulation; the most popular (and probably most palatable) way to ingest the placenta. Read on for excerpts from the interview. “As our bodies recover from birth and our hormones start to align back into balance – placenta encapsulation supports this process. It supports everything physically; the healing of the pelvic floor, the uterus going back down to size, it gets the breast milk flowing and just the hormonal rebalancing overall. The placenta is meant to nourish and help the hormonal imbalance that happens postpartum. There hasn’t been research showing it helps with postpartum depression, but it helps with the emotional hormone shift called “baby blues.” Placenta encapsulation can really help support women with the hormone drop they experience post birth. I have seen it firsthand with a mom who was on the boarder of having postpartum depression and anxiety, but she took her pills and within half and hour she was a completely different person. There’s not enough conversation around the postpartum period. There’s so much focus on preparing for the baby and the birth. But when the baby arrives it’s, like wait, where is my support on the post end? What the body goes through to give birth is just so full on. The body goes through a lot and there is this time of recovery after you give birth. 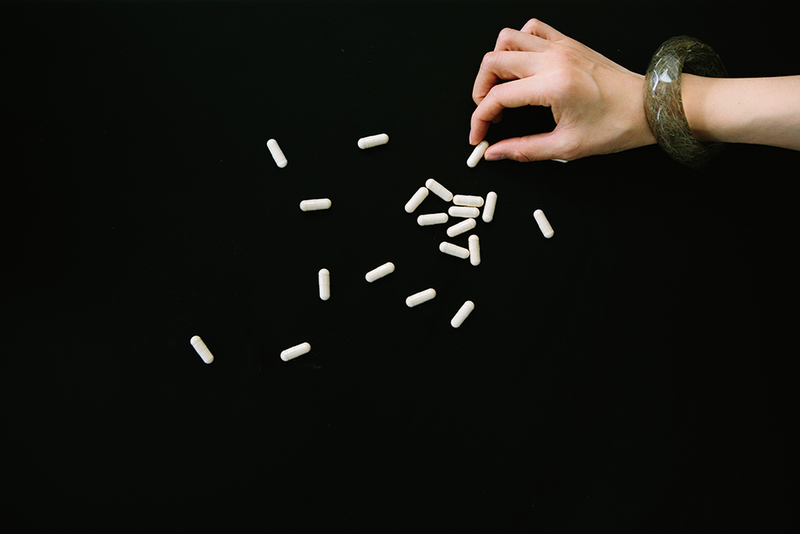 The placenta pills are a way of nourishing the body, replenishing the body on a hormonal level. If you think about it, a woman is pregnant and she has all of these hormones pumping in her body to miraculously grow this baby, but then once the baby leaves the woman’s body she’s left without those same hormones that the body needed to grow the baby. Her body is, like whoa, we’re not pregnant anymore, we don’t have a baby in our body anymore. The body takes a moment to get back to where it was before and there’s a shift. Placenta pills are one of many things that can help ease that transition from being a pregnant body to a non pregnant body. If you think about it, the placenta is nourishment. There are no chemicals in it, no toxins. It’s something that your body made to help support the life growing inside of you. It’s from your own body. Most mammals naturally eat their placenta. As soon as a cat gives birth or cows they lick off their babies and eat their placenta. That’s the way animals get the nourishment back into their bodies by eating their placenta. That’s just nature doing it’s thing. Most times I bring home the placenta for a client right after the birth because I’m also their doula. But I do have people who hire me to go to the hospital and pick it up even if I’m not doing the doula services. So I bring it home and first clean it and then I do a little blessing while burning sage around it. I steam it and then dehydrate it in a dehydrator for 20-24hrs. The duration depends on how big the placenta is. If its an 8-9 pound baby the placenta is bigger, but if it’s more of a 6 pound baby, they can dehydrate faster. Afterwards I grind it down to a really fine powder and encapsulate the powder. Sometimes if the client wants, I will work with an acupuncturist and add Chinese herbs based on their recommendations and mix those in. A big placenta can create over 100 pills, but usually I get anywhere from 80-100 pills. I like my moms within the first two weeks postpartum to take two pills three times a day, but everybody is different. Even myself when I went through my own process my placenta pills made me very hyper, so I couldn’t take them at nighttime only in the morning or midday. Mine gave me a lot of energy, but not every woman is going to experience that. I like for women to really get it in the first two weeks postpartum and then from there they can taper off and see how they feel. I cried when I took my last placenta pill because they made me feel so good. I was like, “No!! !” I can never forget it. I can even tell you what I was wearing that day. You keep them in the fridge and I was standing at my refrigerator and I took my last placenta pill. I had big tears about it. It felt like the completion of the birth process. The first month postpartum is a sacred time and really it’s considered the fourth trimester even though your baby is outside of you. There still is a process of bringing the baby into the world and if it’s a first time mom, especially for first time moms, she’s just birthed a new version of herself, so she’s now a mother whereas before she was just a mama to be. The only mamas I would advise not to do placenta encapsulation are ones that may have had an infection during pregnancy or if they are advised not to by their doctor for whatever reason because maybe the placenta would not be safe because of an infection. This spiritual, natural beauty shared her getting ready moments with us. Read about Paula Mallis’ beauty routine here.